No matter whether you have a big apartment, house with several floors, or a garden - Mesh with FRITZ! brings fast and stable wireless LAN to every corner of your home. Simply add additional FRITZ! products to your home network, for example FRITZ!Repeater and FRITZ!Powerline with wireless LAN, and the FRITZ!Box meshes the individual wireless networks to form a large wireless LAN. As the Mesh Master, the FRITZ!Box transmits all of your wireless settings (for example account information, guest access, schedule) to the other FRITZ! products in the home network. This way you have to set up only one wireless connection on your smartphones, tablets, and notebooks to gain access to the home network and your FRITZ!Box's internet connection via every FRITZ! product. It is extremely easy to integrate new FRITZ! products into your Mesh: Simply push the "Connect" or "WPS" button on the FRITZ!Box (Mesh Master) and the new FRITZ! product - that's all! Now it is even easier to automatically set up the wireless connection via WPS (WiFi Protected Setup): Simply push the "Connect" or "WPS" button on any FRITZ! product in the home network, and you can quickly and easily connect any WPS-compliant smartphone, tablet, or notebook with your wireless LAN. 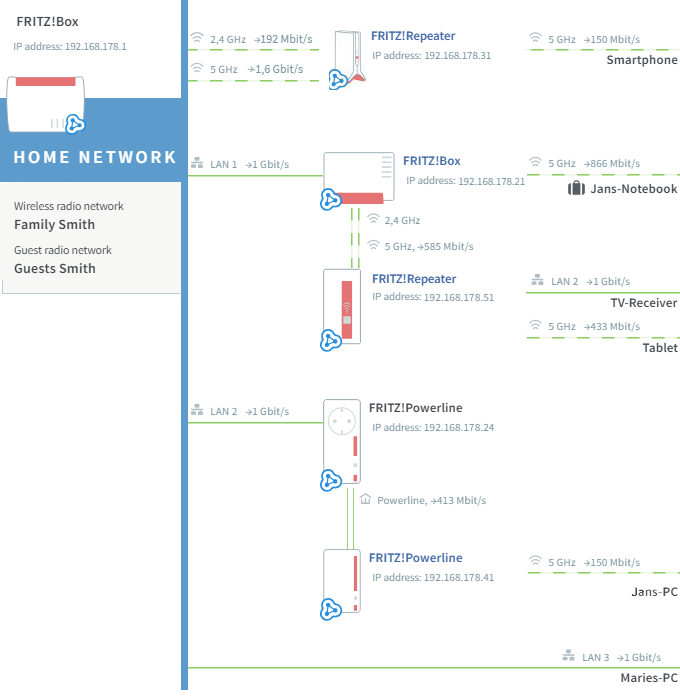 The FRITZ!Box's Mesh overview always shows you which devices in the home and guest network are currently active, how they are connected with each other, and which throughput rates are available over the individual connections. And, if an update is available for a FRITZ! product, you can install it directly via the Mesh overview with the click of a mouse. FRITZ!Repeaters with dual-band wireless LAN use intelligent crossband repeating to ensure that data is transmitted to the FRITZ!Box via wireless LAN without speed loss. FRITZ!Powerline adapters with wireless LAN are integrated into the home network with gigabit speed using your home's electrical wiring, which means you can use them outside the wireless range of your FRITZ!Box. Mesh with FRITZ! also supports the cascading of FRITZ! products. This way you can also connect a FRITZ!Repeater with a FRITZ!Powerline adapter in your home network over wireless LAN and integrate it into the Mesh, for example. With Mesh, all FRITZ!Repeaters and FRITZ!Powerline adapters with dual-band wireless LAN also support band steering. This function ensures that wireless devices that support the 2.4 and 5 GHz frequency band are always redirected to the more powerful frequency band.